Home/Events, Industry Events, News/AARO Symposium & Trade Show was a Sold-Out Event! 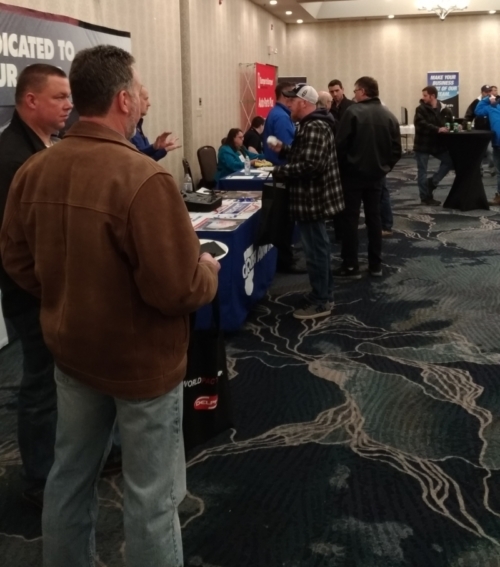 On Saturday, January 19, 2019 AARO held its 2nd Annual Symposium and Trade Show at the Holiday Inn Oakville Conference Centre in Oakville, ON. We had a winter storm that day and even that did not keep the members away. It was standing room only and a sold-out event. We had members who flew in from Ottawa and all over the province. 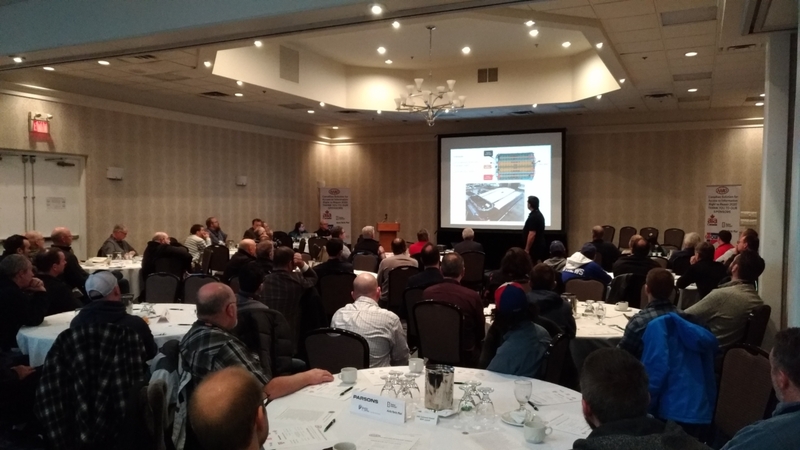 What was the excitement about, it was the lineup of Guest presenters, first was Craig Van Batenburg of Automotive Career Development Centre (ACDC) with Yves Racette, technical consultant from Montreal. They gave a presentation on servicing Hybrids and Electric Vehicles which had the crowd’s full attention. Next up was Donny Seyfer, Executive Officer of National Automotive Service Task Force (NASTF). Donny’s presentation was about the changes to the program and how registration to NASTF is free (www.nastf.org). He also talked about the Vehicle Security Program and how to register to become a Vehicle Security Professional is very easy. Those Canadians who are renewing their VSP have been migrated to the new system and are registered by NASTF. Any Canadian who has already paid the fee in Canada and was not yet processed can register and they will not be required to pay again. If anyone is having issues with registering you can contact NASTF or AARO. John Cochrane of Cochrane Automotive and Mark Lemay of Auto Aide Technical Services joined Donny Seyfer on the stage to provide an update on the AARO Task Force that was newly formed and how we are working with NASTF directly. We want to ensure that the entire Canadian aftermarket technicians are able to access the information to repair vehicles. The AARO Task Force attended NASTF’s annual general meeting in the fall of last year and we will be attending the general meeting in Charlotte in May of this year. 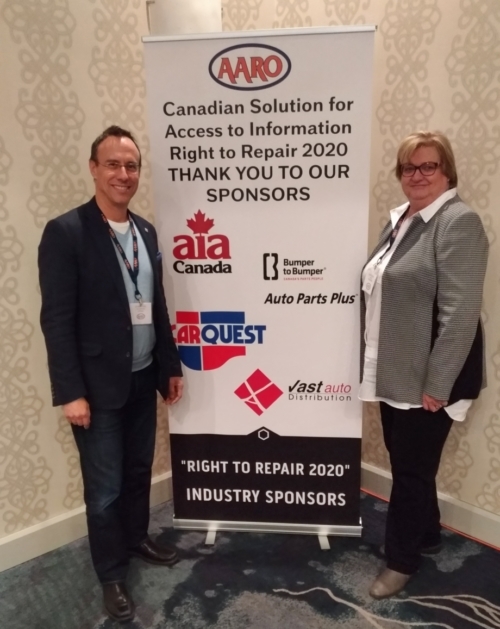 AARO has the support of parts suppliers and distributors as well as AIA Canada on their Right to Repair 2020 initiative to ensure we all have a future in this industry. Following the morning sessions lunch was served in the Trafalgar Ballroom with the Trade Show exhibitors who got a chance to talk about their products, services and equipment and tools to all those who attended. We want to thank all of our Sponsors who so graciously sponsored the event AIA Canada, Carquest, Parsons, PBL Insurance, UniSelect and Vast Auto Distributors.